November was a whirlwind of activity. With building projects, calving, markets, turkey harvest and a major power outage all in just 30 days! After a great season here with plenty of grass, sun and blue sky we are looking forward to the cooler days. With that in mind, it is time once again to order your holiday turkey. All turkeys for Thanksgiving will be available FRESH! Pick-up dates will be Saturday, November 18 inside Fort Andross at the Brunswick Winter Market or on Tuesday, November 21 downtown on the Mall at Brunswick Farmers Market. As always our birds are raised outdoors on certified organic grain and pastures. We are no longer taking orders for turkeys, if you’d like to add your name to our wait list please contact us. Any extra turkeys will be available on November 21. As the days get shorter the tempo of the farm keeps picking up. Though our daily chores take less time our project list remains lengthy. We’ll be installing a new walk-in cooler/freezer on the farm this fall as well as putting up the hoophouse for our laying hens. These pullets (at right) will be the first residents! Despite the lack of rain in July and August we are feeling good about the season overall. Two major accomplishments are the amount of hay produced (3,000 + square bales and 175 round bales) and the clearing & seeding of 12 acres. We are eagerly awaiting calving season, which should begin in another 10 – 14 days. The mama cows are especially loved. The corn husks from the garden and apples gleaned from around the farm are welcome treats. Unlike many of our other animals the calves are pretty elusive. After their first week they are wary of us and jealously guarded by their mamas and aunties. So, once they arrive we spend their first few days seeking them out and stroking their soft, clean hides. Visit the blog for some calf photos designed to tide you over. We had some excellent help in August and you may have seen us at market with our nieces and nephews who hail from Rhode Island and Pennsylvania. It as much fun to have help feeding birds as it having these visitors get us off the farm and out to have fun! We’ll have BEEF this weekend at the BTLT’s Farmers’ Market at Crystal Spring Farm. It looks like there will be more grilling days in our future, so be prepared with some of our certified organic and 100% grass-fed beef. We will have a full range of steaks as well as roasts and slow-cooking favorites for the inevitable rainy days. Our cows perfectly express our ideals of land management as they harvest sunshine in the form of grass and transform it into delicious, healthy meat. Though the holidays seem a safe distance away, they will come sooner than you think! Please plan to reserve your Holiday Birds! Your thanksgiving turkeys are growing rapidly and keeping us entertained with their antics. Geese are ready now and will be available frozen for Thanksgiving or fresh the week of December 19th. These birds are raised on grass, supplemented with certified organic grain and vegetables. Follow these links to reserve your turkey or goose. We’ve almost crested our summer peak! Our final groups of chickens will be harvested over the next two weeks with geese and summer turkeys following soon behind. This is welcome news as another hot, dry summer has left us wishing for more grass. We are turning those wishes into action by using the Maine Grass Farmers Network (MGFN) no-till drill to seed our newly cleared 12 acres. Rollers at the rear. In front you can see the set of coulters that cut open a groove for the seed. A no-till drill is a piece of equipment that allows you to add new species of plants to an existing field or to seed a brand new field (like ours) more effectively. The drill rolls across the ground, uses coulters to slit open the soil, drop in a seed and then another set of coulters and rollers close up the slit over your seed. The advantages of using this tool are that the seed goes just where you want it and the chances of germination are much greater given that it is in contact with soil. As many of you know we own 70 acres adjacent to the home farm. Over the course of just 4 weeks we worked with Comprehensive Land Technologies to open up two existing pastures, the area for our new barn and to selectively thin for silvopasture. We are thrilled with the results and very excited to see the grass grow. Stay tuned for a blog post that will chronicle the clearing. Goat is back in stock! If you haven’t tried it, I encourage you to do so. You can find recipes here. Our cashmere goats are raised on pasture and browse for a lean, mild flavored meat very similar to our lamb. By the first weekend in September we will have additional beef and turkey. Our beef sold in record time this year, so if you are waiting for steaks, thanks for your patience. For now, enjoy the burgers! If you prefer a turkey burger then you’ll be in luck too. 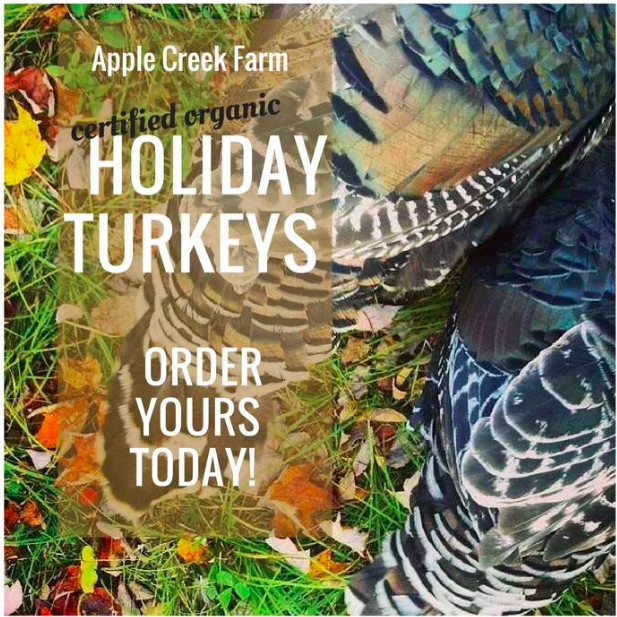 Since we’re talking turkey- you can now order your Holiday Birds! Your thanksgiving turkeys just went outside and are enjoying a summer forage crop of millet. We call the turkeys the “goats of the poultry world” meaning they are always scheming about ways to upend our expectations. Whether by escaping from their brooder, roosting on the cords of their lights or chirping with delight – these birds are never boring! The first group of geese will head to harvest at the end of the month, so if you’re contemplating one for the holidays we encourage you to test one now. These birds are raised on grass, supplemented with certified organic grain and local delicacies like our just ripe green apples. The geese are gorgeous and we’re looking forward to sharing them with you. To order, follow these links to reserve your turkey or goose. Summer lasts only about a 100 days (and not all of those sunny) and so this is our busiest time of year. We’ve been busy making hay, watching our new farm emerge from the forest and moving animals to maximize the lush green grass. Hay has been slow and steady with great yields due to our application of fall manure and this spring’s mix of rain and warm temperatures. The land clearing began just about 2 weeks ago and we’re looking at 13 acres or so of future pasture and silvopasture. Jake and I spent several evenings walking the land and choosing a mix of big and small trees to leave for shade and future timber. The result will be a mixed hardwood forest with enough openings in the canopy to allow grass to grow while offering some shelter for our animals. We have been very pleased with the crew from Comprehensive Land Technologies. Moving animals is a daily activity. Not every animal group moves each day, but each day there is a group to be moved. Our goats have been doing their annual road crew work, controlling the bittersweet along the road edge and clearing along the stone walls. The cows, seven of whom will calve in the fall are getting wider and wider with all the fresh grass they are consuming. We hope you’ll come out and see us this weekend for Bowdoinham’s annual Open Farm Day & Art Trail which coincides with Maine’s Open Farm Day. We will be open from 9AM-1PM offering tours (including a look at our newly cleared land) and a pop-up farm store. What should you expect? Check out our previous Open Farm Day post. You can now order your Holiday Birds! Our Thanksgiving turkeys arrived this week and they are the most feisty birds I think we’ve every had. In just a few short weeks they will head out on pasture where they will be eating a mix of clovers and grasses supplemented by certified organic grain until they are ready to grace your table. We are raising two groups of geese this year to expand availability. Our summer geese have been acting as night watchmen, protecting our chickens from a Great Horned Owl that lives on the farm. The owl’s nocturnal visits usually come at the cost of a broiler so putting a pair of geese in with the broilers scares off the owl. Follow these links to reserve your turkey or goose. Christmas in July! We are offering 20% off all our sheepskins and goat hides July 22 – July 29. You can visit us at market or order online– use code JULY17. Lamb is back! So many of our customers have been waiting patiently- thank you! Our lamb is 100% grass-fed which is part of the reason for the wait. We graze our lambs all summer and this year was particularly tricky with the drought to provide enough forage to help them grow. We will have a full range of lamb cuts- including chops, ground, shanks, stew and more- available starting this Saturday at the Brunswick Topsham Land Trust market. We have turkeys for your Thanksgiving celebration. Follow this link to order yours. Birds will range from 12-20+ pounds, are priced at $5 a pound and are certified organic. We are proud to raise our birds outside, on pasture supplemented by certified organic grains. Our birds are processed at Weston’s Meat & Poultry in West Gardiner one of our local processors who are now MOFGA Certified Organic. We thank the staff at Weston’s and in MOFGA’s Agricultural Services Department for their help in making this happen! 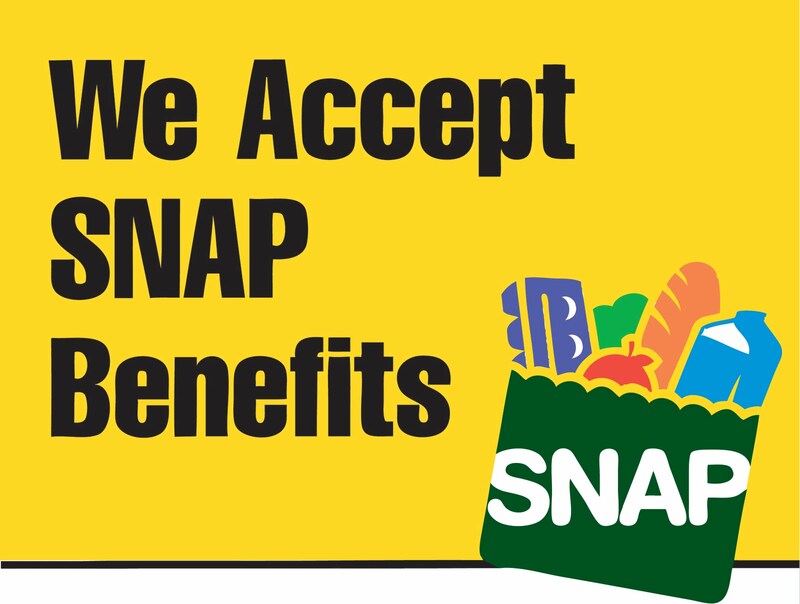 We are now able to accept SNAP (Supplemental Nutrition Assistance Program) & EBT (Electronic Benefit Transfer) at all our market locations. It has taken us a good long while to get there (we started the process in March) but are now equipped with a new EBT card reader and wireless printer. If you receive these benefits you can access the full range of Apple Creek Farm products. We’re really excited to be even more accessible! THIS SUNDAY is Bowdoinham Open Farm Day! Apple Creek will be open from 9-1pm and we look forward to seeing you! Make it a day trip by staying around for the local foods barbeque happening at the Mailly Waterfront Park 3 pm – 6 pm, the meal will include Apple Creek chicken smoked to perfection by event caterer, The Texas Barbeque Company. You’ll see baby animals including our (goat) kids, turkeys and bantam chicks. You’ll see our ruminants including our cows, goats and sheep. Things to consider- Our farm is a working farm, we’ll mow the lawn but don’t expect everything to look picturesque! Please bring appropriate gear such as close-toed shoes or boots, a water bottle and snacks for your smalls. We’ll have a boot wash and ask that if you are coming from a farm with any critters that you wash up before you walk around. Likewise if you’re headed to another participating farm, we suggest you rinse off before heading out. What won’t you see when you visit? Dogs! Having three on-farm dogs, we ask that you make other plans for your canine friends.